Design Contest : Joseph Binder Award is a biannual contest which accepts entries from Graphic Designers, Illustrators, Advertising Agencies and students worldwide. The awards was started in the year 1996 by design austria. Designers can submit their entries in any of the three categories: Graphic Design, Illustration and Design Fiction. Each of the category winners will receive a gold, silver and bronze medal and a collective cash prize of 6000 euros. The winners will be announced publicly on 8th November 2018. 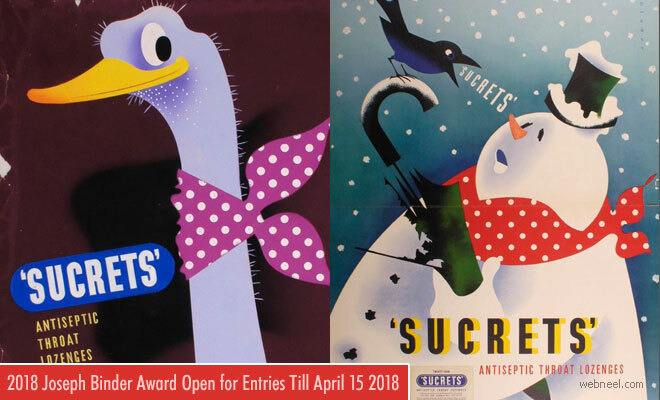 The Joseph Binder Award design contest was named after one of the most prestigious graphic designers and illustrators who made their work stand out during the world war two. Early bird discounts upto 10% if you submit entries before 28 February 2018. For students the entry fees starts from 55 euros($66).